Man-of-the-match Jack Jopson orchestrates another attack for Penarth Hockey Club's 2nd XI in their 5-1 win over Whitchurch at Stanwell. 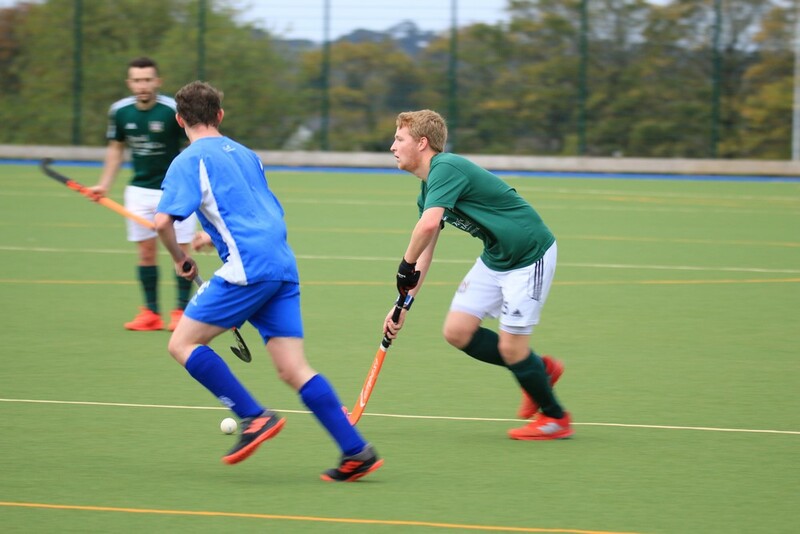 Penarth Hockey Club 1st XI admit that they have homework to do after succumbing to a fourth Verde Recreo Premiership defeat at Cardiff University, but there were better results for the club’s other sides on a packed weekend. Frustrated by their loss to Cheltenham the previous weekend, the 1st XI travelled across the capital to face Cardiff University on match day five of the 2018-19 Verde Recreo Premiership campaign. The Bears got off to a bright start, with captain for the day Chris Baker and Tom Haran making inroads down both flanks, but the visitors would be punished for not making the most of their positive start and the chances it created when the students opened the scoring from a penalty corner midway through the half. Instead of responding positively as usual, Penarth were then guilty of letting their heads drop, duly conceding a rapid-fire second to pile on the misery. However, going two down seemed to kick the Bears into life and, knowing that they needed a goal before half-time to stand a chance of grabbing a result, they dragged themselves back into contention when man-of-the-match Ollie Burland banged in a goal off his back foot just before the whistle. Penarth tweaked their formation during the interval, and the move quickly paid off as the students couldn’t cope with the pressure it brought on their defence. With momentum suddenly going the visitors’ way, the University conceded a penalty flick, which Chris Hardy dispatched with ease to bring the sides level. Having come from two down, and with the upper hand throughout the early part of the second period, Penarth should have taken control of the game and been more patient with their approach, but threw caution to the wind and went all out to take the lead – only to twice be caught on the counter to give the home team a commanding 4-2 lead. The students then added a fifth late on to seal the win and, while Penarth did score a consolation goal through Matthew Grey right at the end, they will need to dig deep and work hard over the next week to right the wrongs and stop the rot before the season gets too far out of hand. The 2nd XI hosted a Whitchurch team which had remained unbeaten through the early part of their campaign and sat in third place in De Cymru & The Marches 2, just one point behind the Bears. Penarth started the game the better of the two sides, and quickly began to dominate possession and territory, but failed to create any clear-cut chances as the visitors put up some solid defence. Just as it appeared that a breakthrough was going to be hard to find, however, James Broad got to the ball ahead of the Whitchurch back line, and beat a defender at the top of the D before mis-hitting a shot that wrong-footed the goalkeeper and crept in at the near post. Although it had taken a stroke of fortune to hand them the lead, Penarth only appeared troubled at the other end when Whitchurch looked to counter-attack, but veteran centre backs Sam Docherty and Dave Stevens put in a commanding performance to break down and breaks at the half-way line and the Bears went into the interval still holding a slim advantage despite continuing to dominate. The second half saw more of the same, as Penarth pressed Whitchurch deep into their own half, with full backs Ethan Ayrton, Tom Griffiths and Aaron Fulton-Brown given the freedom to attack at will. The visitors proved to be a hard team to break down, however, and their deep defending, allied to some impressive goalkeeping, frustrated a Penarth side guilty of some lacklustre finishing at the end of good build-up play. With the game still hanging in the balance with 20 minutes to go, Whitchurch finally grabbed an equaliser having been gifted a penalty corner by a rash challenge on the right flank, but Penarth refused to let their heads drop and, instead, redoubled their efforts. Their resolve was quickly rewarded as as Jasminder Singh provided a touch of class to beat his marker and drive into the D, drawing the last defender before slipping the ball to David Joyce, who fired past the hapless ‘keeper. Any remaining Penarth nerves were well and truly settled just minutes later, this time with Phil Lane chasing a seemingly lost cause to reach a loose ball inches before it crossed the byline and firing a pinpoint cross to Joyce, who again made no mistake with the finish. With the visitors now needing to overturn a two-goal deficit in order to protect their unbeaten season, they committed more men forward, allowing Penarth greater space in attack. Sensing a chance to put further daylight between themselves and the opposition, both in the game and the standings, the Bears went for the kill, with man-of-the-match Jack Jopson winning a turnover on halfway before firing a quick free hit to Sam Chick, who drove into the D and slipped the ball into the bottom corner for 4-1. Although the game was already safe, Penarth added a fifth goal for good measure right at the death, with Fulton-Brown firing home a drag flick to keep the Bears in second overall. Incredibly, with the way fixtures and results have worked out so far this season, Penarth now travel to Wotton-under-Edge for a third successive second versus third face-off, knowing a win would give them breathing space from the chasing pack. Having watched the 2nd XI’s final period surge, the Thirds took to the same Stanwell field to play host to table-topping Neath in De Cymru 2. Hoping that a week without a fixture would not have sapped their form following a 5-2 away win over Bridgend, the Bears started brightly, taking the game to an opposition notably missing a couple of key players. However, for all the patient build-up play, early chances were consistently spurned by the home side, who still had to remain vigilant in defence as Neath’s younger player provided a swift threat on the counter. Penarth eventually earned a little breathing room midway through the half when Richard Cousins swept home at the end of a move that started in the Bears’ own half, but the home side knew that a second goal was needed to prevent any jitters extending into the second half. Again, the Bears proved profligate in front of goal, both from open play and set-pieces, but Jack Daly calmed the nerves with a breakthrough right on the half-time whistle, again following a sweeping move from back to front. With Simon Comfort returning to provide experience between the sticks, the central defensive partnership of Craig Llewellyn and captain James Davies was able to handle the majority of Neath pressure, and the visitors never really looked like pulling a goal back. Cousins and Joe Ramage continued to provide a defensive screen in midfield, often breaking down Neath’s attacks before they materialised, with Elys Johnson linking well with the forward line as Penarth continued to threaten. A third goal stubbornly refused to come for much of the second period, despite sustained pressure from the home side, but Penarth’s differential was eventually boosted within sound of the final whistle when man-of-the-match Lewis Ingram fired home from an acute angle to make it 3-0 and secure second spot in the division for the Bears. The 4th XI travelled to Rougemont holding down top spot in De Cymru 3, but went 2-0 down early in their match with Gwent 3rds. Although they fought back to make it 2-1, the Bears then conceded again before an excellent individual goal from Iwan Meddins made it 3-2 at half-time. Conceding a fourth goal against run of play meant that the visitors had a mountain to climb in order to secure a result, but they came back to 4-3 after a superb team move was rounded off by Zayn Zamam, and had several good chances to equalise, but conceded a fifth right at the end to flatter their opponents. Although Gwent’s victory moves them closer to the Bears in the standings, the Vale side remain top of the table after five games. Having secured their first ever win against Whitchurch ‘F’ the week before De Cymru 3 took a hiatus, the 5th XI was confident of securing further points against the Cardiff club’s ‘G’ side in an early morning fixture played in great spirit at Stanwell. The mix of youth and experience duly produced an excellent game, and would have had a much more comfortable victory had they not been so wasteful in front of goal. Having shared the spoils through the opening exchanges, an excellent individual goal from Mark Robinson made it 2-1 to the Bears at half-time and, although Whitchurch equalised with spectacular tomahawk effort, Ifty Khan produced Penarth’s winner from a penalty corner to continue their rise up the table, moving into fourth spot ahead of another break. Penarth will return to have just three teams in Verde Recreo action this Saturday, with the 1st XI hosting Wotton-under-Edge at Stanwell (1.45pm start) as the Seconds travel to the Cotswolds for a return fixture with the Gloucestershire club’s ‘A’ team (1.30pm start). The 3rd and 5th XIs have a week off enforced by the odd number of sides in their division, but the 4ths will look to inflict further misery on Whitchurch and re-open a gap to top spot in De Cymru 3 on their return to Stanwell (3.30pm start).